High school reunion coming up soon bringing old self esteem memories about your skin to the forefront? Or are you the Maid of Honor in your sisters wedding and you feel rushed to get your skin presentable because you feel as though you look like you've been run over by a Mack truck? Whether it's your high school reunion, your sister's wedding or any other affair that's going to put your face on front street,You're probably looking for a simple and natural solution to rid yourself of dark spots, uneven skin tone and what you know as hyperpigmentation? If not treated, hyperpigmentation can lead to serious problems, so it's a really good idea to have a skin care regimen in place to help you minimize the dark spots and uneven skin tone, naturally. There is an effective and affordable way to clear, clean and restore your skin, minimizing the appearance of dark spots and uneven skin tone. 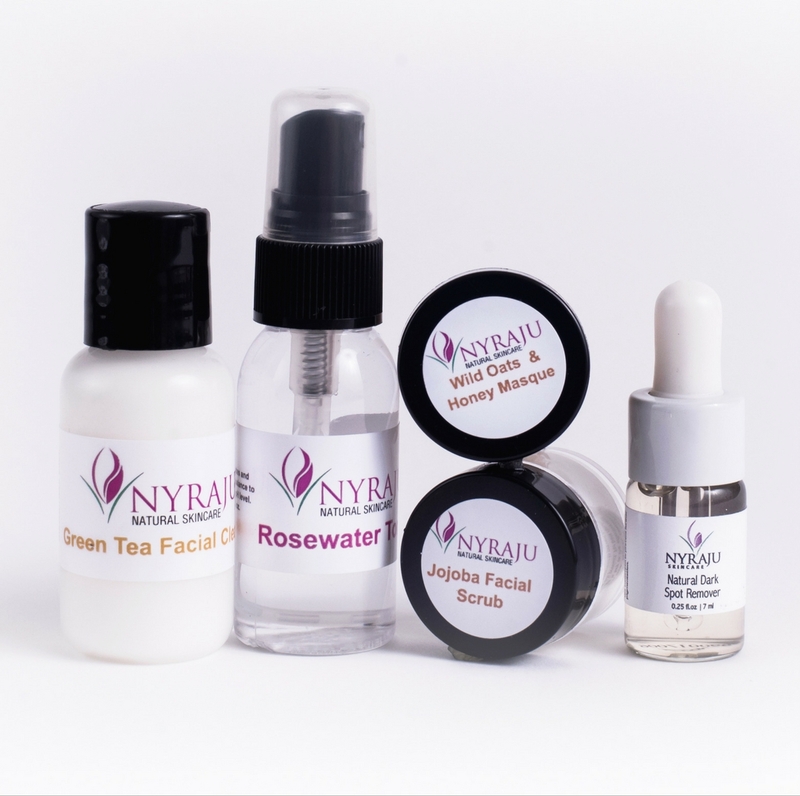 If you're tired of hiding behind make up, allow me to introduce you to Nyraju Skin Care's Natural Skin Care Sample Kit for Dark Spots, Uneven Skin Tone and Hyperpigmented Skin. This skin care system will give you what you've been looking for, clear skin, the appearance of an even skin tone and complete removal or minimized dark spots. Disclaimer : While results may vary from person to person,this area allows clients like you to give us your honest and heartfelt opinions of our products. Nyraju Skin Care does not represent or warrant the accuracy of any statements or product claims made in this section. We do not compensate our clients for any opinions expressed in this section. Rosewater Toner � Wet a cotton ball or square, squeeze out the excess water and add a spritz or two of rosewater toner to it. Rub gently across your face and neck. Wild Oats and Honey Masque - Cleaned your face with Green Tea Facial Cleanser, follow up with Rosewater toner. Then apply a thin layer of the Wild Oates and Honey Masque. Apply to your neck and face once a week. Let it stay on for about 15 minutes and remove with a warm wash cloth. Apply a thin layer of moisturizer. Natural Dark Spot Remover - Only add this product to dark spots. It will naturally lighten and minimize them and they will blend in with the rest of your complexion.